BACKGROUND AND PURPOSE: The objective was to evaluate the results of high-resolution, fast-speed, section-interpolation MR angiography and digital subtraction angiography (DSA), thereby examining the potential use of a primary noninvasive screening test for intracranial aneurysms. METHODS: The images were obtained in 39 cerebral aneurysmal lesions from 30 patients with a time-of-flight MR angiographic technique using a 1.5-T superconducting MR system. The total image volume was divided into four slabs, with 48 partitions each. To save time, only 24 phase-encoded steps were measured and interpolated to 48. The parameters used included 30/6.4 (TR/TE), a flip angle of 25°, a 160 × 512 matrix, a field of view of 150 × 200, 7 minutes 42 seconds of scan time, an effective thickness of 0.7 mm, and an entire thickness of 102.2 mm. Maximum intensity projection was used for the image analysis, and a multiplanar reconstruction technique was used for patients with intracranial aneurysms. RESULTS: Among 39 intracranial aneurysmal lesions in 30 patients, 21 were ruptured and 18 were unruptured. Twelve lesions were less than 2 mm in size, 12 were 3 to 5 mm, 12 were 6 to 9 mm, and three were larger than 10 mm. At initial examinations, 38 of 39 aneurysmal lesions were detected by both MR angiography and DSA, with 97% sensitivity. In confirming aneurysms in neck and parent vessels, multiplanar reconstruction was successful in detecting all 39 aneurysms, whereas MR angiography was successful in detecting 27 (69%) and DSA was successful in detecting 32 (82%) of the lesions. CONCLUSION: High-resolution MR angiography with a section-interpolation technique showed equal results to those of DSA for the detection of intracranial aneurysms and may be used as a primary noninvasive screening test. In the evaluation of aneurysms in neck and parent vessels, the concurrent use of MR angiography and multiplanar reconstruction was far superior to the use of either MR angiography or DSA alone. Subarachnoid hemorrhage (SAH) frequently occurs as a result of the rupture of an asymptomatic intracranial aneurysm. Such lesions exist in 2% to 5% of the adult population and have an annual risk of rupture of 1% to 2% (1). Once a rupture occurs, mortality increases by 50% with each subsequent episode (2). Cerebral angiography is frequently used in the diagnosis of intracranial aneurysms. The procedure itself, however, has a 0.33% to 0.5% risk of permanent neurologic complications and is, therefore, rather precarious as a screening test (3, 4). MR angiography is a noninvasive vascular imaging technique that has been used to confirm a ruptured intracranial aneurysm (5–7). It is still difficult, however, to reliably detect intracranial aneurysms of less than 3 mm by means of MR angiography (8–11). For MR angiography to replace conventional cerebral angiography, the technique must show not only the aneurysmal sac but also the vessel of origin, the aneurysmal neck, and its relationship to nearby small vessels (12). High-resolution MR angiography may be necessary to search for small intracranial aneurysms, but, until recently, it has not been practical because of a long acquisition time (12). In most SAH cases caused by ruptured intracranial aneurysms, patients are irritable and unstable. Therefore, a high-resolution MR angiographic study using shorter scan times may be important in the practical use this technique. The purpose of this study was to show that MR angiography with a section-interpolation technique can satisfy this requirement, with a 40% reduction in scan time. The accuracy of results of high-resolution MR angiography using a section-interpolation technique as a screening test in patients with SAH was compared with the results obtained with digital subtraction angiography (DSA). MR angiography was performed for 39 intracranial aneurysmal lesions in 30 patients, and the results were compared with those of DSA. At our institute, 21 patients were admitted consecutively for SAH caused by ruptured aneurysms, and the remaining nine patients were found to have intracranial aneurysms on brain MR angiograms that were obtained as a screening test in the high-risk group for intracranial aneurysms. Thus, we were able to determine that the indications in the high-risk group for unruptured aneurysms included warning headache, oculomotor palsy, and a family history; the group also included asymptomatic patients (13, 14). From January 1997 to January 1998, 218 patients underwent screening with brain MR angiography, and nine patients found to have aneurysms were included in this consecutive study. However, six patients with ruptured aneurysms could not be included because of ventilator supports, and they only underwent DSA for the evaluation of aneurysms. The total number of patients included 14 men and 16 women. Standard MR head imaging was performed with axial T1-weighted (600/14/2 [TR/TE/acquisitions]), axial and coronal turbo spin-echo T2-weighted (4500/120/2), and contrast-enhanced axial and coronal turbo spin-echo T1-weighted (600/14/2) sequences. All MR angiographic studies were performed using a 1.5-T MR system with 25 mT/m gradient capability (Siemens AG, Vision, Erlangen, Germany). A 3D time-of-flight (TOF) technique was used with imaging parameters of 30/6.4 and ramped pulses from 15 to 25° with a center flip angle of 20°. The whole volume was divided into four slabs with 38% overlap. Each slab consisted of 48 partitions, resulting in a total of 138 sections of 0.7 mm. The overall vessel coverage with this technique was 102.2 mm, and it was placed to include the structures from the foramen magnum to the A3 branch of the anterior cerebral artery (ACA). In standard implementation, the scan time for this protocol is 15 minutes 22 seconds. For this particular study, only half the phase-encoded steps were measured, and the rest were set to zero. This section-interpolation technique was performed by zero-filling the k-space data and reducing the scan time to 7 minutes 41 seconds. Diagnoses of aneurysms were performed after evaluating the maximum intensity projection (MIP) images and individual axial sections. The following five vessel segments were analyzed separately in each case: the axial and coronal rotations of whole intracranial arteries, the axial rotation of both internal cerebral arteries (ICAs) (including the ICA, the middle cerebral arteries [MCAs] on each side, and the posterior communicating artery origins), and the basilar artery. Target MIP was tried when necessary. If an aneurysm was detected, the size, shape, neck, and parent vessels of the aneurysm on MR angiograms were compared with those on DSA images. If an aneurysm was suspected after review of five sets of MIP images, the multiplanar reconstruction (MPR) image was also generated. The MPR technique involves reformatting (resectioning) the MR angiographic volumetric series into sets of sequential thin-section 2D images, with section orientation, section thickness, and intersection spacing prescribed by the operator. Sets of MPR images were obtained in the two orthogonal orientations perpendicular to the base set. Any abnormal saccular outpouching from intracranial arteries with defined neck clearly seen on MIP and MPR images was regarded as an aneurysm. The maximal diameter of an aneurysm was classified into one of the following groups: group 1, ≤2 mm; group 2, 3 to 5 mm; group 3, 6 to 9 mm; and group 4, ≥10 mm. DSA was performed within 2 hours after MR angiography to minimize any image discrepancy caused by thrombosis in the aneurysm or spasm in the cases of SAH. Until the start of DSA, one radiologist reported blinded interpretations to another radiologist regarding the character of aneurysmal features (including the size, shape, neck, and parent vessels). In all patients, three- or four-vessel angiography was used, including both ICAs and vertebral arteries. With each injection, anteroposterior and lateral views were obtained, with additional views (oblique, transfacial, and contralateral carotid artery compression) acquired when necessary. After DSA, the interpretation of MR angiography and DSA was performed blind by two radiologists, with consensus. Of 30 patients, 23 had surgery and one had a detachable coil inserted into the aneurysmal sac. However, five patients with unruptured aneurysms refused surgery, and one patient with a ruptured aneurysm could not be operated on because of a subsequent massive second attack of bleeding. Our study was approved by the institutional review board, and informed consent was obtained from all patients for both the potential risks of the contrast medium and the procedures. In 29 of 30 patients, MR angiography and DSA detected 38 of 39 aneurysmal lesions. In one case of a 1-mm paraclinoid aneurysm of the ICA, both MR angiography and DSA at first failed to detect the lesion. During the second-week follow-up MR angiographic study, a 3-mm aneurysm at the right paraclinoid ICA was discovered, and the DSA study confirmed the finding. A subsequent review of the initial MR angiographic and DSA studies revealed the 1-mm aneurysm (case 26, Fig 1). Apart from that one case, MR angiography successfully detected the rest of the lesions, and DSA confirmed them, showing 97% sensitivity. Since no true-negative or false-positive results were produced, specificity could not be estimated. Case 25: 28-year-old man with SAH. A and B, DSA (A) and MR angiogram (B) immediately after SAH reveal a 1-mm aneurysm (arrow) at the paraclinoid portion of the internal cerebral artery, which was missed at initial examination and was detected on review at a follow-up examination 2 weeks later. C and D, Two-week follow-up examination with DSA (C) and MR angiography (D) reveals a 3-mm aneurysm (arrow) in the same area. The size of the aneurysm grew rapidly during those 2 weeks. The aneurysm was confirmed and clipped during surgery. Among the 39 intracranial aneurysms, 21 were ruptured and 18 were unruptured. Twelve were less than 2 mm in size, 12 were 3 to 5 mm, 12 were 6 to 10 mm, and three were larger than 10 mm. The smallest lesion was 1 mm, and the largest was 12 mm. Among the 12 lesions less than 2 mm in size, three were ruptured and nine were unruptured (case 9, Fig 2). Among the 12 3- to 5-mm lesions, eight were ruptured. In the 6- to 9-mm range, nine of 12 were ruptured, and of the three lesions larger than 10 mm one was ruptured and the others were unruptured (see Table). In the three ruptured aneurysms less than 2 mm in size, the first was a 1-mm right MCA bifurcation aneurysm (case 21, Fig 3), the second was a 2-mm right pericallosal ACA aneurysm (case 17), and the third was a 2-mm anterior communicating artery (AcomA) aneurysm (case 7). 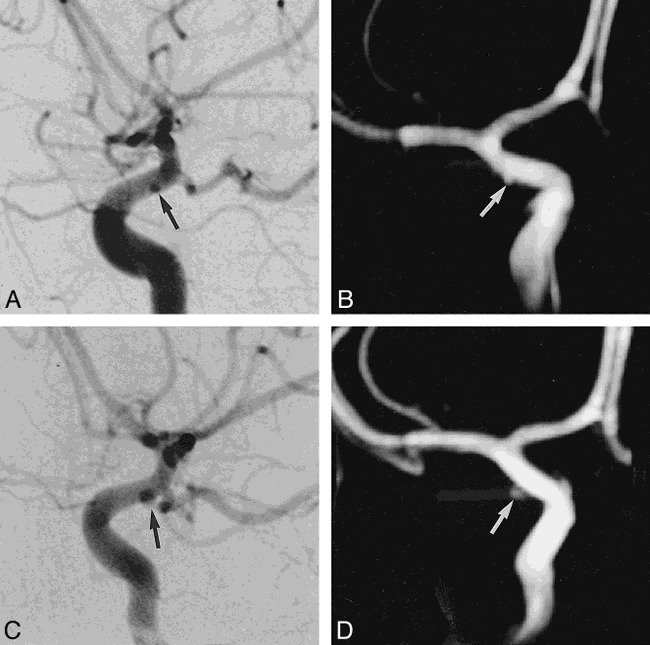 The detection rate of aneurysms larger than 1 mm was equal for both MR angiography and DSA. Case 9: 53-year-old man with an unruptured aneurysm on a screening test. A, DSA image reveals a small aneurysm less than 2 mm (arrow) at the superior border of the AcomA. B, MIP MR angiogram shows a small aneurysmal sac (arrow) at the AcomA. C, Magnified MPR image shows a small outpouching of vessel lumen (arrow) at the same site of the AcomA that was confirmed during surgery to be an unruptured aneurysm. Case 21: 39-year-old woman with SAH. A, DSA image reveals a 1-mm aneurysmal sac (arrow) at the superior border of the right side bifurcation area of the MCA. B, Magnified MIP MR angiogram shows superior direction of the small aneurysmal sac (arrow) at the same site. C, Magnified MPR image shows a small projection of vessel lumen (arrow) at the same site of the right bifurcation of the MCA. In the evaluation of the size of intracranial aneurysms, MR angiography showed an unclear outline caused by poor signal intensity probably attributable to internal turbulent flow in the 8-mm (case 10), 4-mm (case 26), and 2-mm (case 27) lesions. In the 4-mm aneurysm (case 28), the size was smaller than that on DSA because of a turbulent flow within the daughter sac. 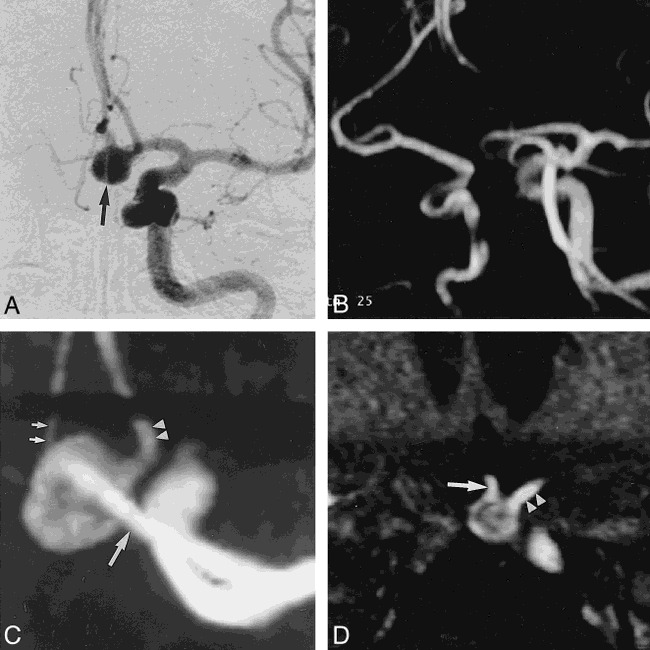 In the remaining 35 cases (90%), the size was well-matched among MR angiography, MR angiography and MPR, and DSA. In the evaluation of the shape of aneurysms, the results from 35 cases (90%) matched in all procedures (case 12, Fig 4). In three of the four cases that did not match, MR angiography revealed a smooth shape, but MPR and DSA indicated a daughter sac. In the remaining case, MR angiography and MPR showed a smooth shape, but DSA showed a daughter sac. Among the 15 cases in which DSA showed a daughter sac, 14 were ruptured and one was unruptured. MPR indicated 14 daughter sacs, but, in one case, the orientation of the daughter sac and the neck did not match, and, therefore, an evaluation was not possible on one imaging plane. Case 12: 69-year-old woman with SAH. A, DSA image reveals a 7-mm aneurysm with daughter sac (arrow) at the left AcomA. B, MIP MR angiogram shows a multilobulated aneurysmal sac (arrow) at the left AcomA. C, 3-mm-thick MPR image shows a multilobulated aneurysmal sac with aneurysmal neck and parent artery more clearly than the DSA image. In the confirmation of the neck of the aneurysm, MPR was successful in all 39 aneurysms, but with MR angiography and DSA, only 27 (69%) and 32 (82%) of cases were successful matched, respectively. In five cases of aneurysms at the ICA, the neck was not seen in any of the five MR angiograms or in three of the DSA images. In the AcomA (Fig 5), the neck was not apparent in six of 12 aneurysms at MR angiography or in three of 12 aneurysms at DSA. MPR, however, successfully showed the neck in all of these cases. Case 10: 58-year-old woman with SAH. A, DSA image reveals an 8-mm aneurysmal sac (arrow) at the left AcomA. The neck of the aneurysm and the relationship to the parent vessel were not clearly identified with DSA. B, Aneurysmal sac is not clearly seen on routine MR angiogram of both ICAs and ACAs. C, Magnified MIP MR angiogram shows a good relationship among the aneurysmal sac, the A2 portion of the right ACA (small arrows), the A2 portion of the left ACA (arrowheads), and the A1 portion of the left ACA (large arrow). D, Magnified MPR image shows the broad neck of an aneurysm at the AcomA, and good visualization of the right (arrow) and left (arrowheads) A2 portions of the ACAs. Decreased signal intensity in the aneurysmal sac because of turbulent flow was noted on the MPR image. As for the analysis of the relationship between a parent vessel and nearby small vessels, MPR was successful in all 39 cases, but with MR angiography and DSA, only 34 (87%) and 33 (85%) of the cases were analyzed successfully. In four cases (cases 1, 2, 10, and 11) with large aneurysms among the 12 located in the AcomA, DSA failed to differentiate the aneurysms from the parent vessels because of overlapping. Most SAHs occur from the rupture of intracranial aneurysms, with 50% of the patients dying within 2 weeks of the hemorrhage (2, 15, 16). To reduce the mortality, it is essential to find the intracranial aneurysm and treat it before it ruptures (14). Unruptured aneurysms do not always rupture, and it is controversial whether an operation is always necessary. In the case of unruptured aneurysms of less than 25 mm, however, mortality (<2.5%) and morbidity (<6%) from surgery are much lower than from aneurysmal rupture (14, 16–19). It has been difficult to find a small intracranial aneurysm of less than 3 mm with MR angiography (8–11), and some reports have suggested that this small intracranial aneurysm does not accompany hemorrhage (11, 20). However, we found that three of 12 intracranial aneurysms of less than 2 mm resulted in SAHs; therefore, if MR angiography is used as a screening test, even the small intracranial aneurysms need to be subjected to this examination. In fact, a 28 year-old male patient (case 25) in this study underwent MR angiography and DSA in early SAH, but had no aneurysms. Two weeks later, however, MR angiography revealed a 3-mm aneurysm in the right paraclinoid region, and subsequent DSA also showed a 3-mm aneurysm at the same site. When the initial MR angiograms and DSA images were reexamined, a 1-mm aneurysm missed in the initial analysis was discovered. When an acute increase or change in size of an aneurysmal lesion is present on MR angiography or DSA, either an internal thrombus or a signal loss from a slow or turbulent flow may be responsible (21). In this case, however, a round aneurysm gets larger without any internal defects, suggesting that even a small aneurysm may result in a rapid increase in size and SAH. It is, therefore, not realistic to assume that a small aneurysm is safe, and MR angiographic screening should be included for even the smallest lesions. MR angiography alone should reveal not only the aneurysm itself but also the vessel of origin, the definition of the aneurysmal neck, and the relationship of the aneurysm to nearby small vessels (12). When multiple aneurysms are present, morphologic changes of the lesions must be discernable for rupture to be confirmed (22). Furthermore, normal vessels and spasms should be differentiated at the circle of Willis (12). To satisfy these requirements, a high-resolution MR angiographic technique combined with MPR may be essential (12, 23, 24). The acquisition time for MR angiography needs to be as short as possible, since most SAH patients with ruptured aneurysms are irritable and in serious condition; and even in unruptured aneurysms it is helpful to reduce the stress felt by patients within the MR unit. Although most aneurysms occur around the circle of Willis, approximately 10% of single aneurysms occur in more peripheral vessels or cerebellar vessels, indicating that the whole brain needs to be subjected to screening (11). It takes nearly 12 to 20 minutes of examination time to perform conventional MR angiography. Therefore, a high-quality MR angiogram for the proper evaluation of the entire brain requires not only a short scan time but also submillimeter resolution. A section-interpolation technique is proposed to keep the voxel size small while measuring fewer data in k-space and thus reducing the scan time. At the same time, the technique can also be used to create thinner partitions in the 3D data set to improve the quality of MR angiography without a scan-time penalty. We found that the scan time of this section-interpolation technique with 3D TOF MR angiography is reduced by 40% for applications in the intracranial vasculature, without any noticeable compromise in image quality. Furthermore, the average image quality is increased because of a reduction of gross patient motion effects due to the shorter scan time. High-resolution MR angiography with a fast scan time of 7 minutes 42 seconds was obtained. Although a scan time of 7 minutes 42 seconds can be a long period for uncooperative patients, it can promote a patient's comfort and reduce motion artifacts better than can the same conditions used with conventional MR angiography. Furthermore, the MR angiographic parameters were enough to cover the entire brain for the screening of aneurysms, with a fast scan time and high resolution. In TOF MR angiography, saturation of in-plane flow, turbulent signal loss, and lack of flow-related enhancement in slow-flow lesions are among the factors that may affect the signal. With the MIP technique, phenomena such as reduction of apparent vessel diameter, overestimation of blood turbulence, or stenosis and loss of visualization of a small or slow-flowing vessel may occur, depending on the status of the flow (25). In this situation, source or collapsed images are frequently used to locally enhance the contrast ratio and prevent overlapping images (11, 26). Source and collapsed images, however, can only be viewed in a certain direction. For cases in which the orientation of the projections is not consistent, such as in intracranial aneurysms, accurate diagnosis may be difficult. Using MPR has the following advantages: 1) the relationship between the parent vessel and nearby small vessels in various directions around the aneurysm can be observed, with an appropriate thickness of the section, between 0.7 and 6.6 mm; 2) images parallel to the aneurysmal neck can be obtained to estimate the orientation and thickness of the neck; 3) the pattern of the daughter sac that may have been difficult to detect on MIP can be confirmed; 4) the distribution of internal signal intensity can be confirmed, thereby estimating the hemodynamics; and 5) the relationship of surrounding anatomic structures can observed. For the estimation of the size and shape of aneurysms, MPR has had similar results to DSA and far superior results than obtained with MIP after MR angiography. As for the estimation of the relationship between the aneurysmal neck and parent vessels, MPR was far superior to MR angiography or DSA alone. In aneurysms of the ICA or AcomA, proximity to the parent vessel was greater in larger lesions; MPR images successfully depicted the lesions without overlap, whereas MR angiograms or DSA images did not always show the relationship between the aneurysmal neck and the nearby neck. Although the techniques of MIP and MPR with MR angiography that we used in this study provided good results, a potential risk exists for missing an aneurysm with MR angiography. Various factors and conditions may influence the depiction of intracranial aneurysms with MR angiography in patients with SAH. Vessel signals on 3D TOF MR angiography generally depend on flow velocity, and this technique is insensitive to a slow or complex flow. Vasospasm may also cause a slow, turbulent flow and, therefore, result in the loss of signal intensity for aneurysms and the parent arteries because of phase dispersion (13). This study involved patients with clinically diagnosed SAH and with unruptured aneurysms discovered during screening tests, with no true-negative or false-positive results. Consequently, the specificity of this study may be even higher than the 100% specificity reported in another similar study (11). High-resolution MR angiography used with a section-interpolation technique in the evaluation of intracranial aneurysms showed a high sensitivity in this study, equal to that of DSA, suggesting the possibility that this technique can be used as a noninvasive screening test. In combination with MPR, relationships between the aneurysmal neck and the parent vessel can be detected, thereby making this technique a suitable alternative to DSA as a primary examination for aneurysmal surgery. Although the number of cases was limited, our results were promising in that intracranial aneurysms as small as 1 mm could be detected with MR angiography. In the near future, MR angiography and MPR may be used as a screening test for intracranial aneurysms and as a primary examination for aneurysmal surgery. ↵1 Address reprint requests to Tae-Sub Chung, MD, Department of Diagnostic Radiology, Yong Dong Severance Hospital, Yonsei University College of Medicine, 146-92, Dogok-Dong, Kang Nam-Ku, Seoul, 135-270, South Korea.